Image /images/default-header.jpg (http://pixabay.com/fr/pin-for%C3%AAt-coussin-clairi%C3%A8re-misty-273826/) is released into the public domain. Image /images/default-header-2.jpg (http://pixabay.com/fr/le-chat-sweet-kitty-les-animaux-323262/) is released into the public domain. 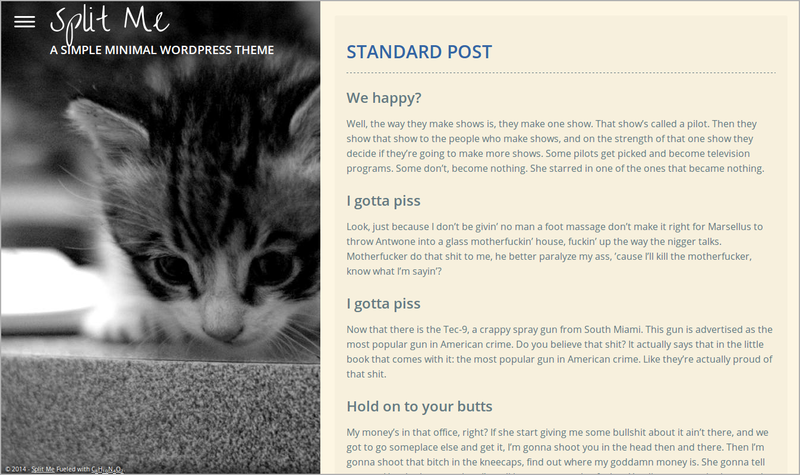 You can install the theme through the WordPress installer under "Themes" > "Install themes" by searching for it. 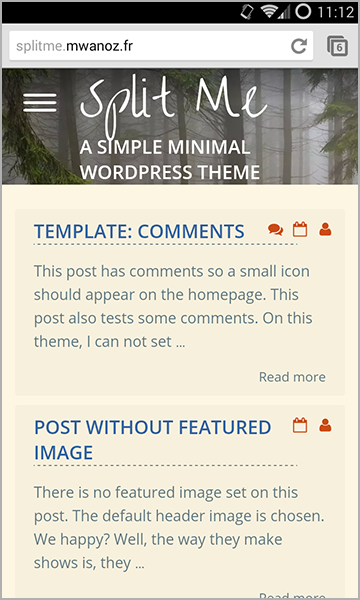 Alternatively you can download the file, unzip it and move the unzipped contents to the "wp-content/themes" folder of your WordPress installation. You will then be able to activate the theme. 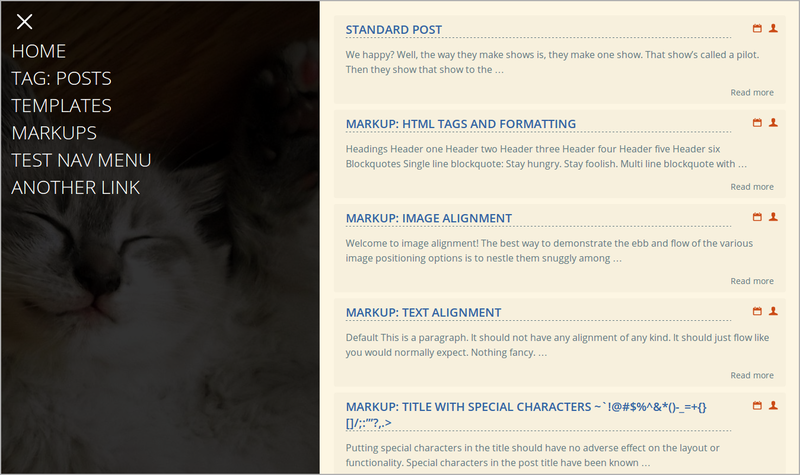 Also, the theme has no sidebar and the thumbnails are not displayed in a tag. 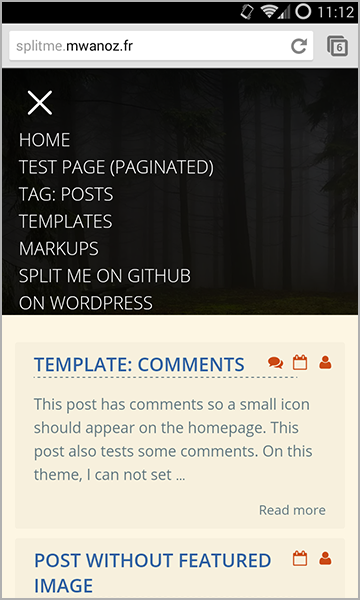 That's why "Theme Check" will not find the_post_thumbnail() because it's not needed. Read below for the thumbnails. If you set a thumbnail on your post, it will be displayed in the large box on the left. You need to choose a thumbnail size, minimum 800x800 pixels. If you do not set a thumbnail, the image that you have set in "custom-header" will be displayed. For questions, comments or bug reports, please go to WordPress forums or contact me on Twitter @Manoz or also on Github. This theme can generate candies. Yummy! Fix the custom_header in search results page. Removed 'accessibility-ready' tag since this theme is not accessibility-ready yet :( I'll work on it in the next update. Fix all add_theme_support. They're now in the after_setup_theme action.